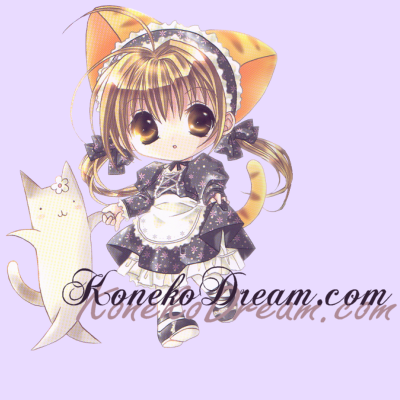 Welcome to KonekoDream.com (associated with SparkleSugar.com), a collective of websites created and maintained by Aurae. Shades of Pink archives the various coloring-book images I have made from official Bishoujo Senshi Seeraa Muun animation screen-shots. Chibi Usa is my favourite character and also extremely difficult to find decent pictures of, so the blanks are all of her. This is a website dedicated to my cute and somewhat-cliche Chibi Sailor Team. In future Crystal Tokyo, four children mysteriously appear before the Sailor Team who are later revealed to be imperfect clones. When they are awakened as sailor soldiers, it just gets more confusing--especially because they're just starting kindergarten. Sailor Aranis (my most near & dear created sailor soldier) profile is not particularly updated, but I still like having it around. Sailor Aurora is another of my fan-created sailor soldiers. I'm hoping to eventually write a cohesive fan-fiction for her, but I never have as much time or inspiration as I'd like to have! KonekoDream.com � Aurae 2002-2015 and is not to be reproduced, in part or in whole, without express written permission. Original scans of the images used in this layout are courtesy of Party Night [now inactive]. Di Gi Charat � Koge Donbo and Broccoli International. No infringement is intended or should be inferred.